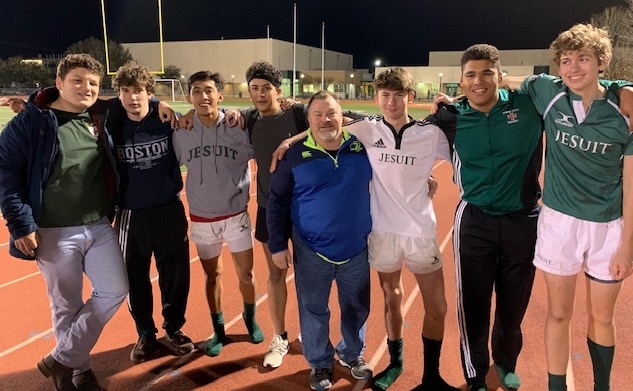 Quite a night on the Rugby field at Strake Jesuit on January 25, watching Strake Jesuit Varsity team play West Houston Rugby Club. Mr. Monks attended to see former Western Ruggers hard-charging on the pitch just like when they were at Western. Old Boys ruggers appear, left to right: Joey Figueroa (2015), Matthew Granberry (2015), Alvaro Directo (2015), Andy Gosselin (2016), Coach Monks, Trip Twardowski (2016), Pablo Granados (2017), Christopher Hoekel (2017).